Since we last interviewed Ray Wilson four years ago, he's released two studio albums and two live albums. He's also made guest appearances on a number of other musician's projects and has toured almost non-stop across Europe and, most recently, South America. On April 25, 2005 World of Genesis.com's own Dave Negrin had a brief conversation with Ray to talk about his new live album, Ray Wilson Live, his three previous solo projects, and what lies ahead for the former lead singer of Genesis. WOG: I know that you have worked with Nir recently on your solo projects, but would you ever consider asking Mike Rutherford or Tony Banks to appear on your next solo record? Do you think they would appear on one of your albums if you asked them to? RW: I thought about asking them to do a charity gig with me recently, just a few songs acoustically, but the situation wasn’t quite right. I’d like to ask Phil to play drums on one of the Stiltskin tracks, but I haven’t decided which one to send him. I’m not sure if he would do it though. World of Genesis: Ray Wilson Live marks the first album without the support from Inside Out Records. What prompted your departure from the label? Was it a mutual decision? Ray Wilson: They are actually distributing the Live CD for me. We still have a good relationship, and I have a lot of respect for the company. 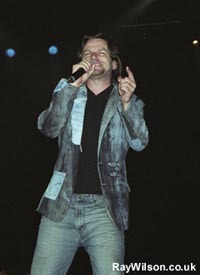 The next project I’m doing is a Stiltskin CD, and I feel that it is better to take a new approach with this CD. It is still possible that I will work together with Inside Out again in the future. WOG: Since you have sold out of the Guaranteed Pure discs on your site, and you have additional unreleased material on cassettes or DATs from that era of your career (that have not surfaced on CD), have you ever considered releasing a complete anthology of Guaranteed Pure’s music in a double disc collection via your website? RW: I have one or two things on DAT but I doubt that they will ever be released. WOG: You seem to recycle musicians from your old bands and incorporate them into session musicians or band members for other future projects. How did you get involved with your old Stiltskin mate, Irvin Duguid, again for the Change and The Next Best Thing albums? RW: I guess it is always good to work with familiar people and talented people like Irvin and Nir Z.
called Unplugged. Is it true that MTV threatened legal action if you continued to use that album title? Please explain. RW: No, but once Inside Out decided to release it commercially, we thought it was better not to take the risk. WOG: Why did you decide to re-record Stiltskin's hit "Inside" as part of your The Next Best Thing solo album? RW: It was supposed to be sung with a female, but I couldn’t get her to do it. I would like to do this song with Sandra from Guano Apes or Skin or someone who can sing hard and powerful. WOG: Having released your first live album, Live and Acoustic, just a few years back, were you hesitant to release a double live album? RW: I always regarded Live and Acoustic as more of an official bootleg than a proper live album. The new Live album sounds much better than Live and Acoustic, and it's a true reflection of the last few years of my career. 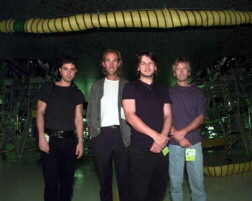 Genesis in '97 with Wilson (center) RW: It was supposed to be sung with a female, but I couldn’t get her to do it. I would like to do this song with Sandra from Guano Apes or Skin or someone who can sing hard and powerful. WOG: The Change album was a very, sort of stripped down, raw, acoustic driven album for the most part while the follow-up album was a more complex, really diverse - primarily electric guitar driven rock album. Did you intentionally want to release something drastically different from Change when you went to write the songs for The Next Best Thing? WOG: I noticed that you did some South American tour dates in April. Is there a chance that you may come further north for some North American gigs at some point? RW: Not really. I have no offers for North America yet. It has never been a market for me, so I never give it much thought, really. I do receive a lot of e-mails from fans, and it is good to know that I have some fans over there. Maybe one day, but there are no signs of any North American gigs yet. RW: I was caught in two minds really. I enjoyed doing the more acoustic songs as Ray Wilson and the harder stuff with Stiltskin. This is my plan for the future. WOG: Your site described The Next Best Thing as being a heavily introspective, personal album. Would you consider this album to be the most vulnerable you have ever allowed yourself to be as a songwriter? What brought about that willingness to expose yourself on this record? WOG: You incorporate a diverse blend of music from throughout your career in your live shows. Are there any songs you feel obligated to play to the fans? RW: Yes, I feel it is important to entertain people and do the best show you can. I try to play for two or more hours, so that I can cover all the musical styles and keep the Genesis fans, Stiltskin fans and the Ray Wilson fans happy. I do my best with this, but I can’t keep everyone happy all the time. When I tour with Stiltskin next year, I will not play any Genesis songs and that will please some people, but not others. RW: Both Change and The Next Best Thing are personal. I like to be open and express my true feelings through music and also in interviews. That is a big part of being an artist, in my opinion. WOG: Have you seen the Genesis Video Show DVD? Were you pleased with the 5.1 mixes of the Calling All Stations tracks and remastering of the music videos for DVD? RW: I haven't seen it. WOG: Can you share any details on the forthcoming Stiltskin album? When do you expect to release it? 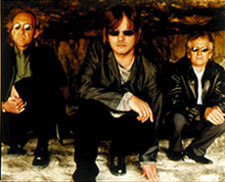 RW: It’s a much harder Stiltskin CD with Nir, Alvin, Uwe, Irvin and Scott Spence all in the band. I feel it’s the best music I have recorded in my career. It will be released early next year. WOG: Are you still in the process of shopping the album around to different record labels, or will this be an independent release? RW: I haven’t approached any labels yet as I will wait until it’s finished. RW: I will, but only when I feel I have something worth releasing. WOG: Do you ever look at fan sites or the Forum on the official Genesis site to see what fans are saying about you? RW: Not really. I get e-mails and messages on my message board from time to time about reviews and comments that have been made. I do talk to fans at gigs though and I’m always interested to hear the views. WOG: How did you get involved with Armin Van Buuren for the "Yet Another Day" single? Did the idea of transforming a straight-ahead rock tune like Cut’s "Another Day" and turning it into a dance-orientated track initially appeal to you? RW: I met him in my friend’s nightclub several years ago. I like to collaborate with other musical styles, and I found "Yet Another Day" quite interesting. Armin has also remixed the song "Gypsy," and he asked if I would do a couple of shows with him in North America. It could be fun to do, this but it’s not confirmed. Click on the album artwork to buy the CDs or to hear sound clips. WOG: How did you get involved with TurntableRocker for the song "Love Supreme?" RW: My producer Peter Hoff shares a studio with DJ Thomilla from TurntableRocker, and T homilla and Michi Beck (Hausmarke) asked if I would write a song with them. "Love Supreme" was the end result. WOG: How did you get involved with the RPWL track, "Roses?" RW: They contacted [his management] and asked if I was interested in singing a track. I really wasn’t too interested until I heard the song. I think ["Roses"] is really good, and they have produced an excellent album. Ray's second studio solo album! Includes "These Are The Changes", "The Actor", "Pumpkinhead", "The Fool In Me", a new modernized version of Stiltskin's "Inside" and much more! 2007 live album featuring a mixture of music from the two Stiltskin albums plus classics by Cut and Ray's solo catalog. Includes: "Sunshine and Butterflies", "Sarah", "Another Day", "She", "Fame", "Inside" and more! Recommended! Special thanks to Ray Wilson for granting this interview. This interview is © 2002-2007 David Negrin and may not be reproduced in whole or in part without permission. For more on Ray Wilson, Please visit his official website.